Cotton Braided Sparkplug wire There are	5 products. 7mm cotton braided spark plug wire. 10 feet of 7mm Black dull finish sparkplug wire, cotton braided just like the old style, vintage reproduction. 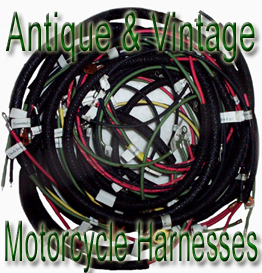 10 feet of 7mm Black Gloss finish sparkplug wire, cotton braided just like the old style, vintage reproduction. 10 feet of 7mm Oak with Red and Black tracers gloss finish sparkplug wire, cotton braided just like the old style, vintage reproduction. 10 feet of 7mm Oak with Black tracer gloss finish sparkplug wire, cotton braided just like the old style, vintage reproduction. 10 feet of 7mm Yellow with Red and Black tracers gloss finish sparkplug wire, cotton braided just like the old style, vintage reproduction.